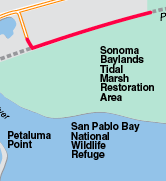 Today, I barely made it back to the car by sunset, because I was enjoying sweeping views along this long straight trail (red line on map) by the bay, and interesting clouds, a faint half rainbow (shown), lots of wildflowers, birds, and nice "golden hour" light and colors. The Bay Area is filled with people; however, as is often the case, I saw one other person on this trail, at the very beginning. So, it was very quiet and peaceful. The afternoon breeze settled down about 1/2 hour before dark. The path itself was surrounded by grasses and wildflowers, and was hard to walk through in spots. However, I think it was because it was fairly overgrown that I saw two mice -- one (unfortunately) recently deceased. 22 red-winged blackbirds; 13 ducks; 2 killdeer (on path); 5 swallows; 3 live rabbits (+ 1 deceased); 17 little brown jobs (LBJs); 100 unidentified brownish and brownish/white shorebirds out in or flying around the mudflats; several spots with little brownish ground flies; 1 ladybug; 1 kite; 2 orange and brown butterflies/moths; 1 dead mouse + 1 live one; 1 crow; and 1 Canada goose.